Warner Bros. Pictures has just released a “Justice League” parody movie poster for “Teen Titans GO! to the Movies.” Check it out below and watch Teen Titans GO! to the Movies” in Philippine cinemas July 26. “Teen Titans GO! to the Movies” finds our egocentric, wildly satirical Super Heroes in their first feature film extravaganza—a fresh, gleefully clever, kid-appropriately crass and tongue-in-cheek play on the superhero genre, complete with musical numbers. The film is being directed by Aaron Horvath and Peter Rida Michail, from a screenplay by Michael Jelenic and Horvath, based on characters from DC. Michail, Will Arnett, Jed Weitzman, and Peggy Regan are producing, with Sam Register, Jelenic, and Horvath serving as executive producers. 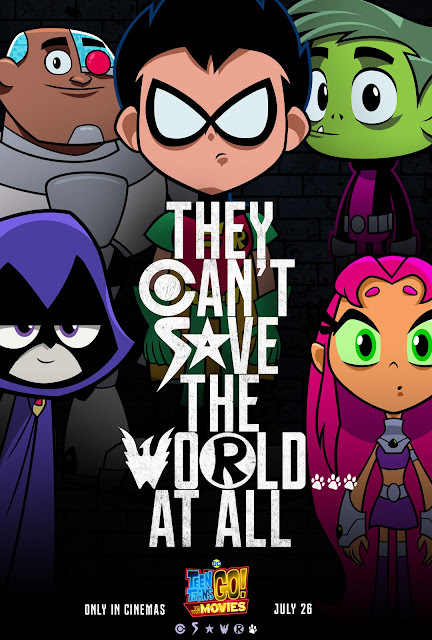 Apart from Arnett and Weitzman, all are “Teen Titans GO!” series contributors.